Eumig S934 showing auto-threading path for picture and sound. 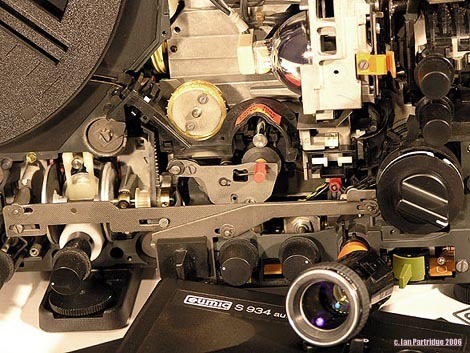 do not have a 'swing-out' gate for cleaning as do 16mm projectors. plastic nut driver that allows unlocking and removal of the sound pressure pad for cleaning. remove fluff or dust from the magnetic sound head below the gate. Access to the gate may be restricted on your Super-8mm projector. The lens may be removed to brush the gate via the empty lens port. A Selvyts or lens cleaning cloth for use when checking the film. suddenly on spool sides that may have been squeezed and squashed. A bad spool can cause the film to break. fuses, spare projection lamp, a table lamp or torch. ensure any interruptions will be brief. Run the projector forwards for a brief time before threading film. occur between the last roller and the take up. fluff and dust before showing. easily be felt going through. 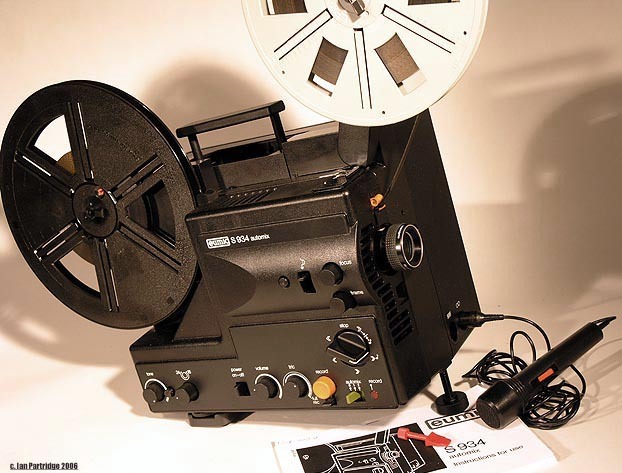 The auto-threading system found on Super-8mm projectors. carefully rethreading without damage to the film. side and the perforations at right. are on the outside, while the soundtrack, soundhead are on the inside. rotating, with the film slowly emptyingitself onto the floor. up spool can be turned with a pencil stub. projector for focus, volume, and tone levels at all times. 'sounds right' then switch on the lamp. I have just purchased one of these machines my eleven year old son has got me interested due to his fascination with super 8 . I have successfully put a film on correctly but I find it won't wind onto the empty reel when in the feeder clamp bit as I don't want to tear or scratch the film on the tiny perforation teeth sprocket any suggestions would be great. 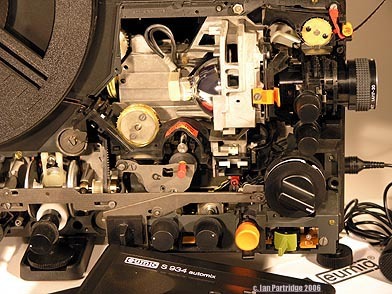 For Super-8mm projectors details will vary with each make or model of your projector. rotate? (If not, may indicate perished or broken or misplaced take-up belt). paper wedge to correct, and use an 'auto-thread' spool if available. With sound projectors threading is always when the sound heads are raised. Usually the first forward setting on your projector. www.Ian-Partridge.Com ~ Web page content photography and design ~ Copyright ©2010 ~ 2017 Ian Partridge.